Download a blank fillable Dd Form 2654 - Involuntary Allotment Notice And Processing in PDF format just by clicking the "DOWNLOAD PDF" button. Complete Dd Form 2654 - Involuntary Allotment Notice And Processing with your personal data - all interactive fields are highlighted in places where you should type, access drop-down lists or select multiple-choice options. AUTHORITY: 5 USC 5520a, EO 9397. DISCLOSURE: Voluntary; however, failure to provide a response may result in the involuntary allotment of the member's disposable pay. Forces or the Coast Guard under 5 USC 5520a. due, then the commander must immediately provide a copy of Sections I and II to DFAS (or the Coast Guard Pay and Personnel Center). 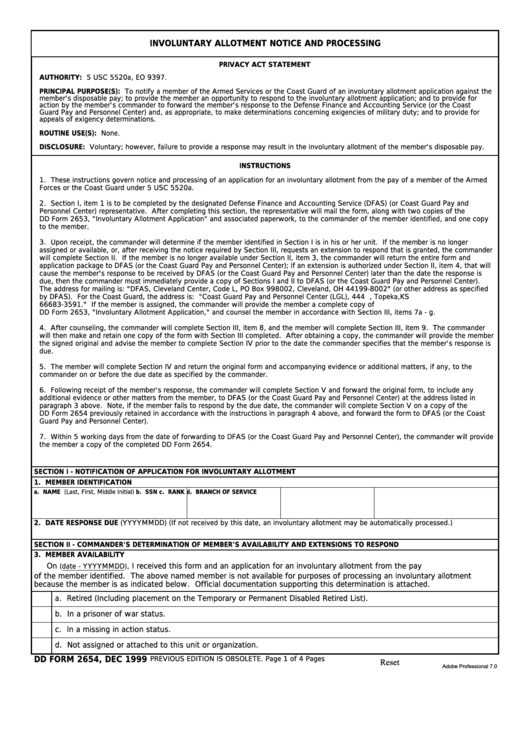 DD Form 2653, "Involuntary Allotment Application," and counsel the member in accordance with Section III, items 7a - g.
commander on or before the due date as specified by the commander. Guard Pay and Personnel Center). the member a copy of the completed DD Form 2654.
because the member is as indicated below. Official documentation supporting this determination is attached. a. Retired (Including placement on the Temporary or Permanent Disabled Retired List). b. In a prisoner of war status. c. In a missing in action status. d. Not assigned or attached to this unit or organization.